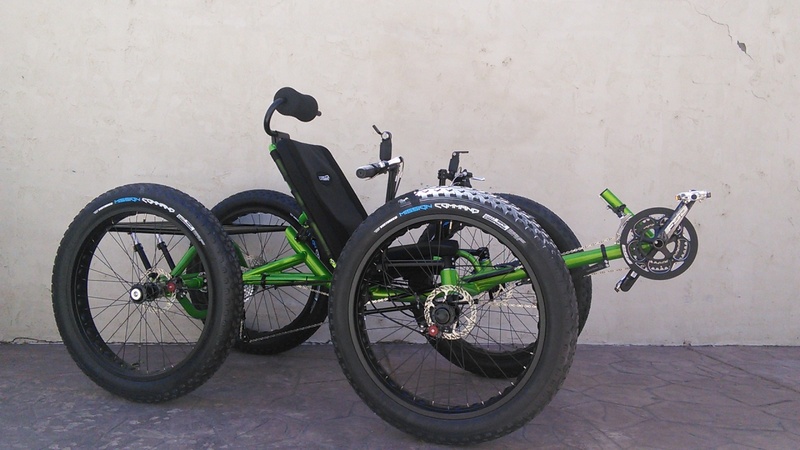 Introducing the FAT CAT-4. 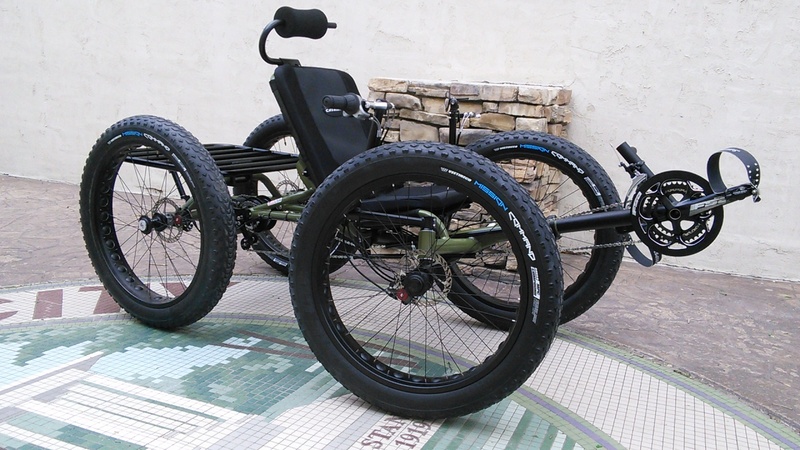 This new Catrike Quad configuration is based on our popular Army Quad. 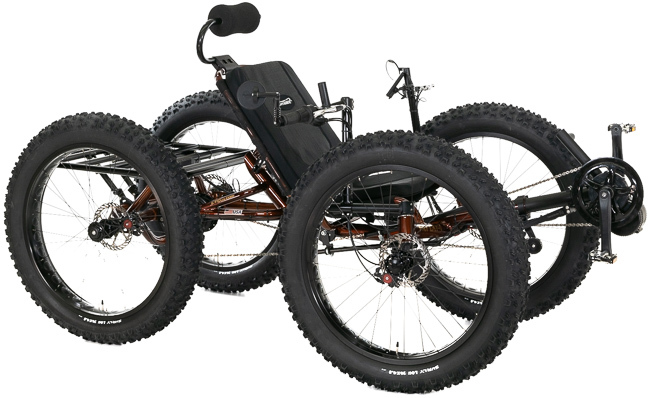 Equipped with 26x4 inch FAT tires, this quad is a blast to ride. 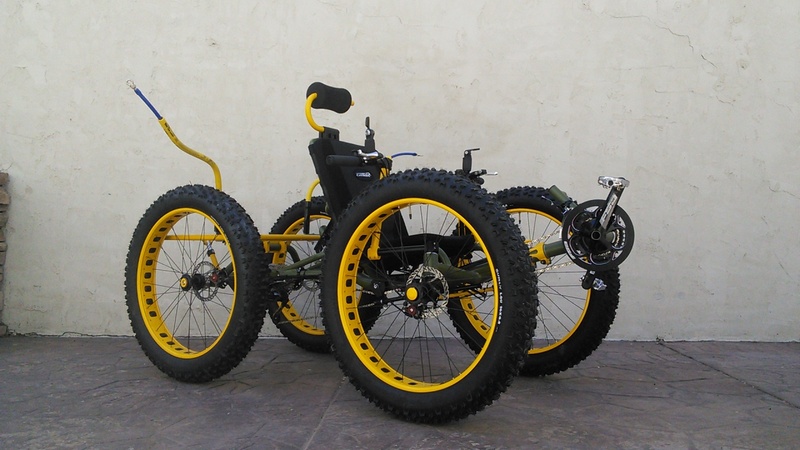 Great for the beach, rough roads, or anywhere you're willing to take it. 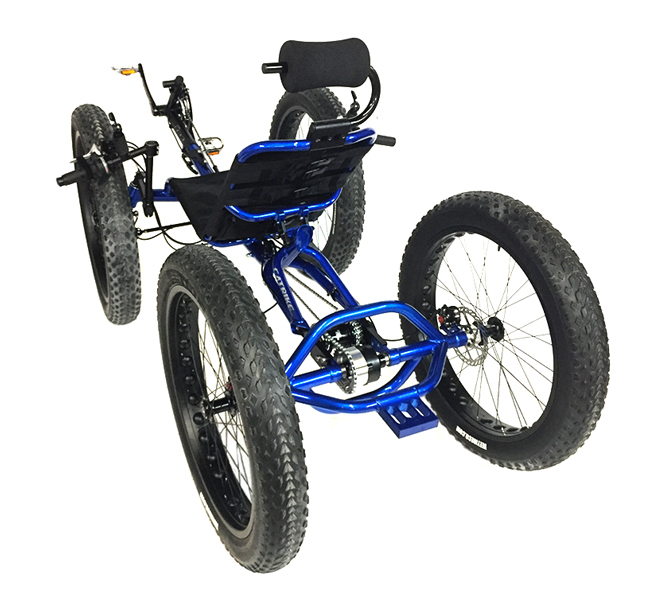 Like any other trike that we build, the choice of gearing is yours. We offer many different options for special purposes, but we think that most people will be happy with our choice of the stock gearing. With the incredible success of our Annihilator X90, we decided to use the same components for the Fat Cat-4. You get an incredible wide range of gears with solid performance. Front Gearing - At the front, the Fat Cat-4 features the FSA Gossamer Triple Crankset. 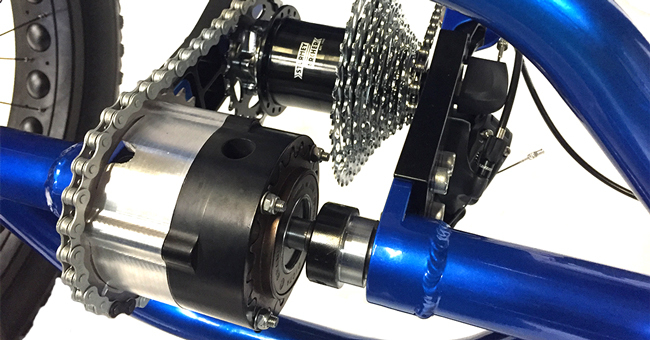 The Gossamer has an external bearing bottom bracket and comes with an integrated chain guard. The chainring sizes are 52, 42, and 30 teeth, so you get a wide range and smooth shifting. Rear Primary Gearing - The middrive utilizes a SRAM wide range 11-36 tooth cassette paired with a SRAM X7 10-speed derailleur. 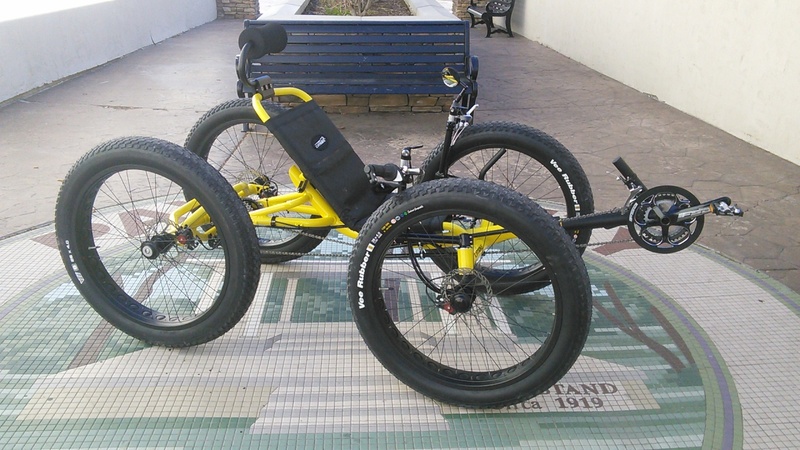 Shifting is smooth and reliable with a great high gear and terrific low climbing gear. Rear Secondary Gearing - In combination with the derailleur-based gearing we are using the Sturmey Archer 3-speed hub as the middrive. This allows you to keep the efficiency of a derailleur in a 1:1 mode and have an extra range of low and high gears. Shifters - With different gearing components you need three shifters. For the derailleur gearing we use the SRAM TT500 bar end shifters. They are easy to use and reliable. The 3-speed Sturmey Archer middrive is controlled by a three-speed hub. The placement of the shifters is intuitive and makes choosing the right gear easy. 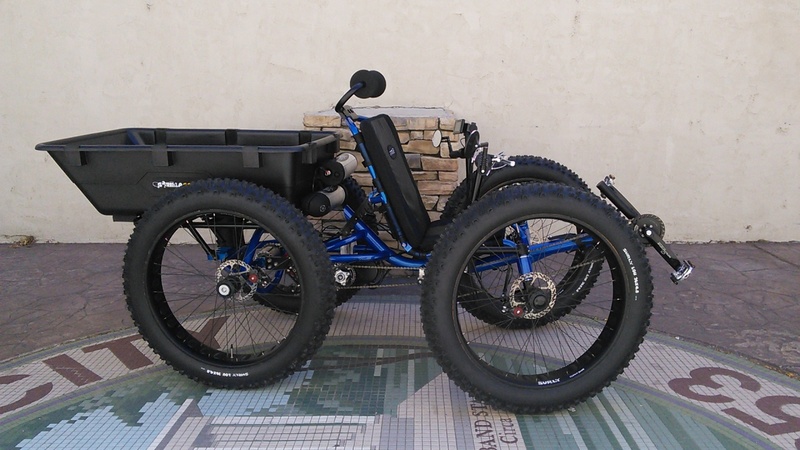 The first thing people notice with the Fat Cat-4 are the humongous tires. We went with a custom rim by Origin8 that has cutouts to keep the weight down. For some added bling, we can add some color with the WIDE Surly rim strips that show through the cutouts. Where the rubber hits the pavement we chose the Vee8 26x4in folding tires. 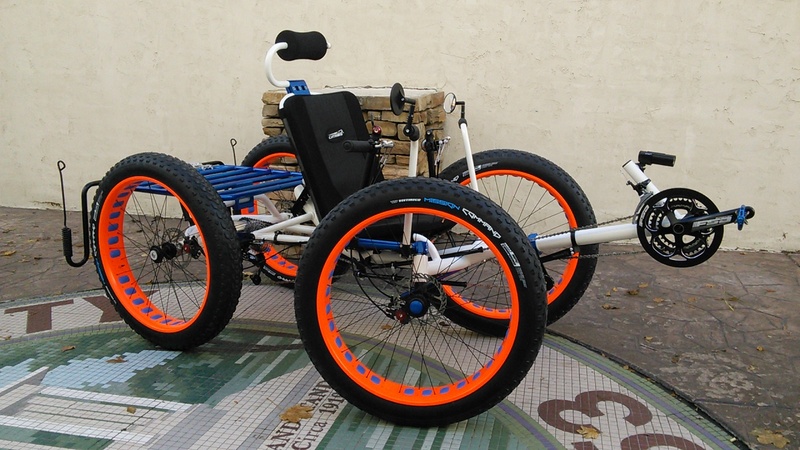 The tire tread is good for riding on the road, the beach, snow, or anywhere you want to go. 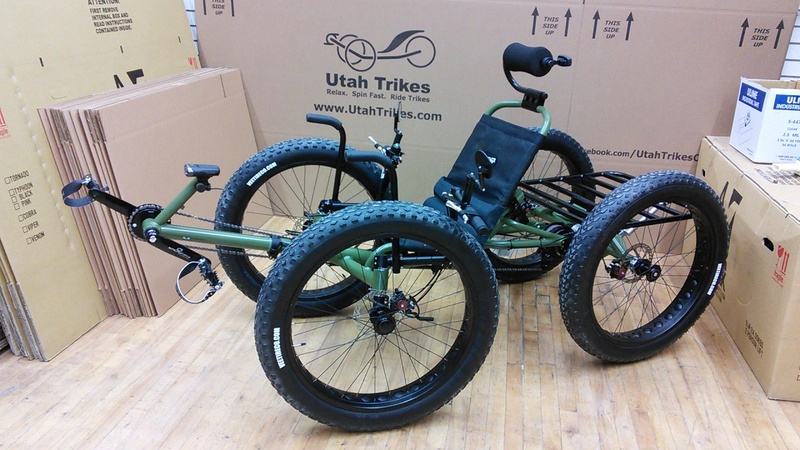 Utah Trikes has been making Custom Quads since 2008 and the Cat-4 platform is the culmination of our experience. 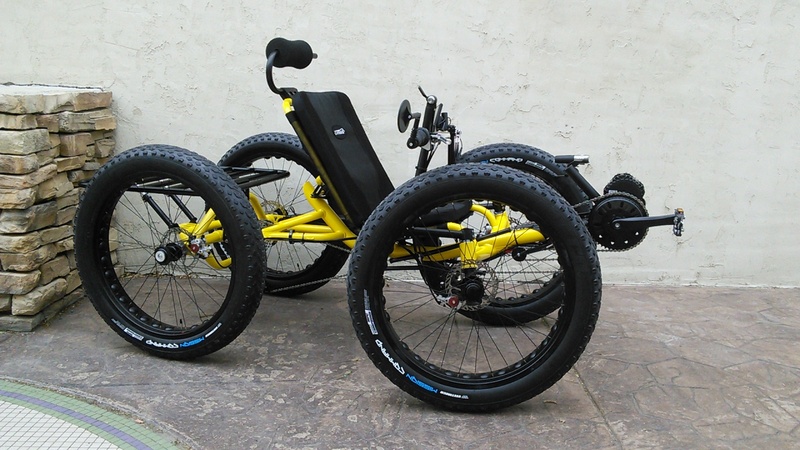 Our custom Cat-4 rear end interfaces with the Catrike frame and adds two-wheel drive to the trike. For the Fat Cat-4 we are using our own frewheel posi-traction geared differential and hardened steel axles. We can attach multiple drive interfaces to the differential included various middrives, gas and electric motor systems. We have 500W, 750W, and 1000W systems preconfigured under the FRONT GEARING option as well as other motor options available. Of course, we can add additional batteries for increased range. Just let us know and we'll make sure you get the right setup!